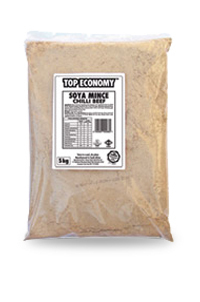 TOP ECONOMY Soya Mince is the affordable, top quality Soya Mince option when catering for large social gatherings or other feeding programs. It can be served with rice, pap, potatoes, pasta, samp, vegetables and bread or as desired. It can also be used to extend meat dishes as well as add texture, flavor & taste.